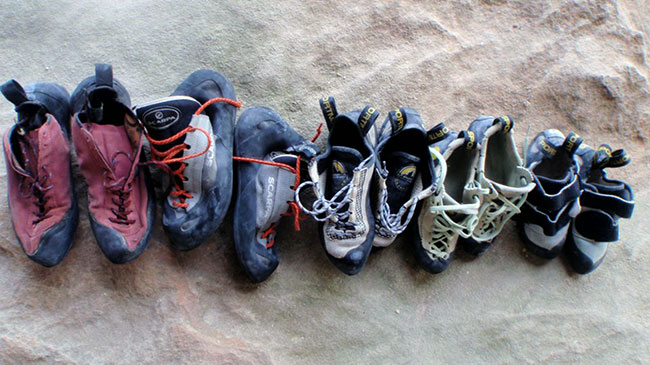 Which rock climbing shoe is the stinkiest? Image: Chelsea Brunckhorst. Climbing shoes stink. It's almost a fact of life. Is there anything you can do about it? Well, Bogong staff James Scott-Bohanna knows a thing or two about smelly feet—err, shoes. So, we grilled him for answers. What causes climbing shoe stink? A build-up of bacteria, basically. You've got bacteria on your skin permanently. That includes the bottom of your feet. Bacteria breed more easily in warm, moist environments. And your sweaty feet jammed into a climbing shoe creates perfect conditions. Synthetic materials are less breathable than natural fibres like leather (see La Sportiva Mythos climbing shoes). What can I do about climbing shoe stink? Dry your climbing shoes between uses. Pull them out of your backpack and let them air. Don't lie them in the sun, because sun can affect the glues holding your shoes together. Some people wear socks. Many people don't, because of the slip-factor. Slippery socks can cause your foot to move inside your climbing shoe, which is not ideal. Put moisture-absorbing balls inside your shoes. You can wash climbing shoes, but it's hard to do. You'll need to do it by hand, with a scrubbing brush, and use mild detergent. Chalking up your feet would help, in theory. Chalk reduces how much your feet sweat (and therefore the moisture in your shoes). Storing your shoes in your car won't necessarily have an effect on smell. But, any excessive heat is bad for climbing shoes. That's because heat can affect glue bond, causing your shoes to fall apart quicker. Also, heat accelerates how fast rubber perishes. James Scott-Bohanna works at Bogong Equipment. He's an expert on smelly feet.